When it’s hard to decide what color nail polish you want to wear–go for color-changing nail polish. Why pick when you can have magical nails that change color in the light. I’ve gathered the best color-changing nail polish that doesn’t need a LED or UV nail lamp here. If you’re looking for color-changing gel nail polish, head on over to my guide to Color Changing Gel. Color-changing nail polish can mean a lot of things. The first thing most people think of is mood polish which changes in response to temperature but the color changing catalyst can also be sunlight or even just the angle at which you’re viewing the polish. 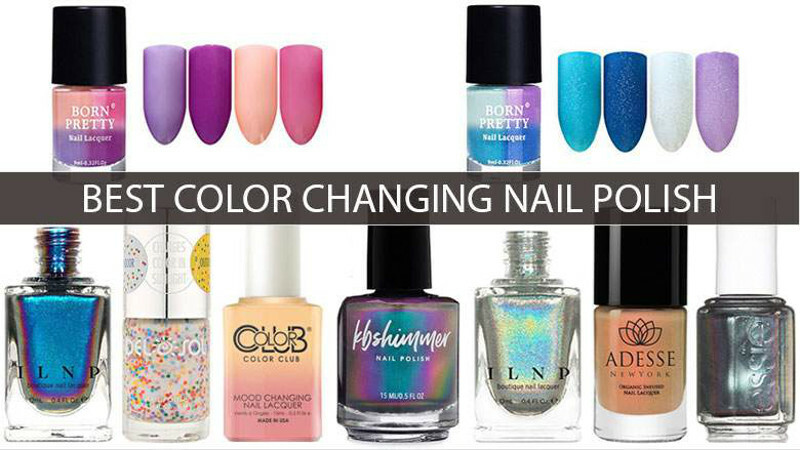 Let’s go over the types of color changing nail polish you’ll find in this guide. Think mood rings. This kind of polish is made with leuco dye which is transparent at warmer temperatures but opaque when cold. In solar nail polish the lacquer contains tiny crystals that become chemically excited by UV radiation–also known as sunlight. When they’re removed from light, the crystals more slowly calm down again and become invisible. Multi-chrome is something else entirely. It sometimes called duo-chrome or chameleon polish. This is a polish that appears as one solid color, but if you shift the angle of your hand a few inches it becomes a completely different solid color without needing any change of temperature or sunlight. The pigments in multi-chrome polish are reflective and settle into layers on your nail with certain pigments lower than others so when the light hits the nail surface one way it’s one color. When the light hits it at a slightly different angle, the light is reflecting off a different layer of the polish showing a totally different color. Holographic is a little bit of a controversial pick for color changing nail polish, but I think certain ultra-holographic polishes meet the criteria. Holographic polishes aren’t reflective like a mirror–they’re refractive like a prism. These polishes take normal white light and break it down into tiny rainbows. That is literally color changing so I’m including one in this guide. Enough with the science. Let’s get to the polish. See the full review from Heavy right here.